AID/WATCH is a member-based organisation and we need your help to continue our work as an independent monitor of Australia’s aid and trade. We draw our meaning from representing our members who are a broad group of Australian’s who agree that how our aid money is spent is important. 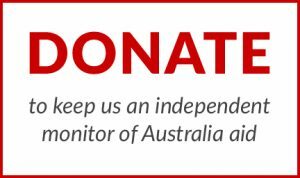 There are a number of ways in which you can help AID/WATCH continue our important work as the only watchdog of aid and trade in Australia. [/toggle][toggle title=”Volunteer your time”] Volunteers form the backbone of our organisation. Thanks to the efforts, passion and dedication of many volunteers over the last 21 years, we have worked towards more transparent and accountable Australian aid and trade and raised awareness about why this is important. Whatever your skills, we can make use of them in contributing to our mission to build a world in which aid is no longer necessary. 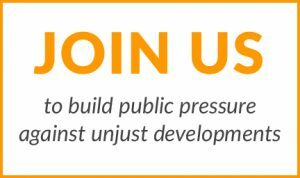 We have a special interest in those with strong research skills, a critical analysis of aid, trade and other global systems, and people with strong campaigns and advocacy experience. If this sounds like you, please email us today. You don’t have to be in Sydney to be a volunteer with AID/WATCH. Internships at AID/WATCH are a fantastic opportunity for students to gain valuable experience in the sector while gaining accreditation towards the completion of relevant studies. Email us to find out about what opportunities are currently available. [/toggle][toggle title=”Join our mailing list”] Sign up to our mailing list on our website for details of other events AID/WATCH is holding or supporting through-out the year, such as conferences, protest actions and fundraisers. Sign up for regular e-news. [toggle title=”Join our AID/TALKS discussion series”] We hold a monthly discussion series on aid and trade related issues in Sydney. Aid Talks is a series of free, public discussion forums aimed at engaging the community in conversation and debate on key international development issues, and other issues which relate to the system which perpetuates poverty such as trade and debt. Aid Talks brings in different speakers each month and focuses on a topical issue. Past sessions have included the Militarisation of Aid, Food Sovereignty vs Food Security, Trade and Aid, and Mining for Development. We take recommendations from members on what you would like to see covered in coming months and for those who can’t make it or aren’t in Sydney, we make each session into a free podcast available online. Interested in starting an AID/TALKS in your city? Let us know! [/toggle][toggle title=”Fundraise for us”] Fundraising for AID/WATCH is a great way to support our work, raise awareness about the need for effective, transparent aid and have enjoy yourself. It’s the single most powerful thing you can do to help us fight for a fair and just aid and trade system and ensure that we actively work to ensure that our taxpayer money does not support harmful projects in developing countries. Hundreds of people in Australia support us in the small ways they can to ensure someone is monitoring Australia’s aid and trade. Their contribution made a difference. Yours will too. Whether it’s a barbecue, bowling day, dinner, or workplace collection, we can support your idea. If you’re stuck for inspiration, you can always give us a call or send us an email. Fundraising pages are all about having a good time for a good cause. These pages make it quick and easy for you to collect donations from your friends and family safely online. It’s easy to get started. Some places you can use include ‘Fundraise Online’ and ‘Everyday Hero’. If you’d like to sell tickets to an AID/WATCH fundraising event, you can try “TryBooking’. Get in touch [/toggle][toggle title=”Work with us”] Working with Aid/Watch is an opportunity to create real change in Australia’s aid and trade policy and to work in solidarity with communities in the Global south adversely affected by Australian foreign policy and aid. Aid/Watch is seeking to engage dynamic, enthusiastic people for vacancies on our Committee of Management. The Aid/WATCH CoM is actively involved across almost all aspects of Aid/WATCH’s work, including research and editting, media releases, events organising, fundraising and membership. If you’re passionate about holding the Government accountable for their aid and trade policy and share a view that poverty is political, and preventable, we’d love to hear from you.